LOUDON, N.H. – Until an uncharacteristic miscue on pit road cost him precious track position late in Sunday’s 5-Hour ENERGY 301 NASCAR Sprint Cup Series race at New Hampshire Motor Speedway, Kevin Harvick appeared a likely candidate for Victory Lane. 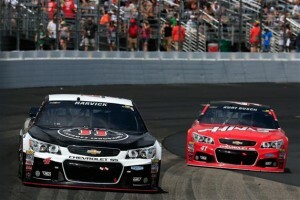 Harvick was leading the race when NASCAR called the sixth caution of the event on lap 251 because of fluid on the track. But after a slow four-tire stop, Harvick’s No. 4 Chevrolet was fifth off pit road and restarted sixth because eventual race winner Kyle Busch stayed out on seven-lap-old tires. 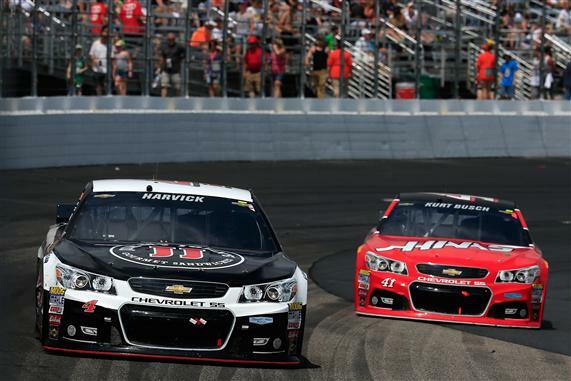 Harvick quickly moved to fourth, and on Lap 288 of 301 he passed Joey Logano for the third spot. But the reigning series champion couldn’t overcome the loss of track position on pit road. Nevertheless, Harvick believed the four-tire call was the right one. “I think we had the right strategy, just a little miscue on the last pit stop,” he said. “Those guys have done great all year. They did great today. It just took me a little longer to get around a couple of those cars and lost the track position. Two months hence, that is, when the Cup series returns to New Hampshire for the second race in the Chase for the NASCAR Sprint Cup. After qualifying 23rd and having his No. 24 Chevrolet damaged during a run-in with Clint Bowyer in the NASCAR Sprint Cup Series garage on Saturday, Jeff Gordon reversed his ill fortune in Sunday’s race. Though he fought the handling of his car late in the race, Gordon held on for a ninth-place finish, improving 14 spots over his starting position. “Honestly, that’s the kind of effort that this team has been putting in a lot lately,” Gordon said. “We haven’t been coming to the track in the position that we really feel like we could be, like we were last year. We’ve got some catch-up to do there; but, my gosh, one thing we’re not lacking is determination and just the ability to overcome adversity. I’m really proud of that. An unusually hot New Hampshire day produced temperatures that adversely affected several drivers, even with cool boxes as standard issue in the cars. Both Michael Annett and Matt DiBenedetto were treated in the infield care center for heat-related issues after the race. Both were released soon afterward. “Everybody’s working real hard inside the cars,” fifth-place finisher Dale Earnhardt Jr. told PRN’s Steve Richards. “This is a track where you’ve got to drive real, real hard every lap. The corners don’t work for you to where you can kind of settle into a pace.